These premium White A2 folded cards are ready for your art work, printing, stamping, and water color. They are laser and Inkjet compatible with a super smooth finish to the card stock. 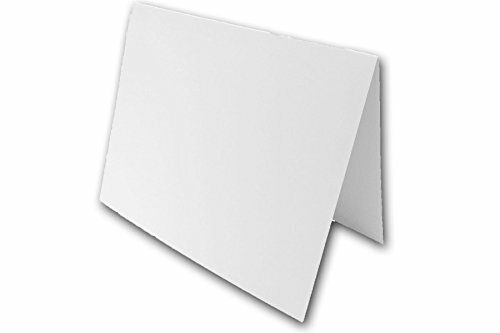 These standard size blank white A2 folders can be enclosed in A2 or 5-1/2 baronial envelopes. They arrive to you flat with a professional score line making them easy to fold and enclose in your envelope. View More In Note Cards. If you have any questions about this product by CutCardStock, contact us by completing and submitting the form below. If you are looking for a specif part number, please include it with your message. Set of 16 Mermaid Thank You Note Cards & Envelopes 4.75" x 3.25"